Are you tired of having unfulfilling relationships? 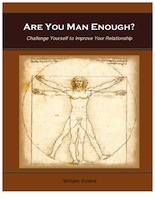 Are You Man Enough is written by the layman for the layman. It is written by a man who has done the research and is sharing what he found with any man willing to listen to what he has found out and what he has to say. In Are You Man Enough the author has taken personal experience and trusted research, and backed it up with personal interviews with real people you might run into in your daily life. He asks the questions about what they expect from relationships, both from the male and female perspective, then discusses it in every day English without complicating it or trying to tie it to an expensive “program” or to sell a set of DVDs. After two crashed marriages, William Downs decided that he needed to find a new way to have a successful relationship. “I knew that I could not, I would not, put myself through that financial and emotional pain again, and never again would I put myself in a position of feeling so alone, so foreign to everyone I knew." He took that time after the divorce to get to know himself, find out what needed to be changed, and to begin doing the work to be whole again. Now he wants to share the knowledge of how to do that with you. At age 53, my second marriage crashed and burned. I felt very alone, very lonely, and tired of making the same mistakes over and over again. What is my mission? It was to do away with any psychology mumbo jumbo, talk straight up, man to man about what I had learned to anyone that would listen.